The 15th day of the 1st lunar month is the Chinese Lantern Festival because the first lunar month is called yuan-month and in the ancient times people called night Xiao. The 15th day is the first night to see a full moon. Historical celebrating this holiday would be like: there should be thousands of colorful lanterns hung out for people to appreciate. 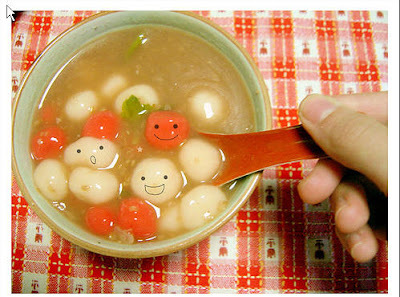 At this time, people will try to solve the puzzles on the lanterns and eat yuanxiao (glutinous rice ball) and get all their families united in the joyful atmosphere. Yuanxiao is the special food for the Lantern Festival. It is believed that Yuanxiao is named after a palace maid, Yuanxiao, of Emperor Wu Di of the Han Dynasty. Yuanxiao is a kind of sweet dumpling, which is made with sticky rice flour filled with sweet stuffing. And the Festival is named after the famous dumpling.It is very easy to cook - simply dump them in a pot of boiling water for a few minutes - and eaten as a desert.